When you like, live forever, what's there to live for? 'About three things I was absolutely certain. First, Edwart was most likely my soul mate, maybe. Second, there was a vampire part of him - which I assumed was wildly out of his control - that wanted me dead. And third, I unconditionally, irrevocably, impenetrably, heterogeneously, gynecologically, and disreputably wished he had kissed me'. And thus Belle Goose falls in love with the mysterious and sparkly Edwart Mullen in this hilarious send-up of "Twilight". Pale and klutzy, Belle arrives in Switchblade, Oregon looking for adventure, or at least an undead classmate. She soon discovers Edwart, a super-hot computer nerd with zero interest in girls. After witnessing a number of strange events - Edwart leaves his hash browns untouched at lunch! - he saves her from a flying snowball and Belle has a dramatic revelation: Edwart is a vampire. But how can she convince Edwart to bite her and transform her into his eternal bride, especially when he seems to find girls so repulsive? Complete with romance, danger, insufficient parental guardianship, creepy stalker-like behaviour, and a vampire prom, "Nightlight" is the hysterical tale of a vampire-obsessed girl, looking for love in all the wrong places. This book was good and fun to read but it didn't quite live up to my expectations. 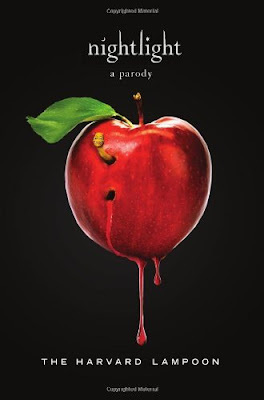 After reading New Moan only a short while ago i thought to read another twilight parody, there was a big hype around this at the time, but i really don't understand why! The book is to fast paced and it doesn't give enough detail. It skips from one place to another, and to be honest it's not all that funny. This book was made to sell, not to be good. Harvard Lampoon clearly knew about all the twilight haters out there and grabbed the chance to sell, quickly writing a crap book and calling it a twilight parody, where New Moan is a decent sized book, where time and effort has been spent on it so it is actually good, and funny like a parody should be. The characters were badly created with no good background or foundation. The names were not good at all, my favorite twilight parody name so far is 'Stella Crow' from TwiLite. Yes there are 3 twilight parody's on the market at the moment. The setting is poorly described, and imagination is poor. Really this book is not good and if you want a good twilight parody, please check out New Moan, but really don't wast your money because that's the only reason this book is here. So really I would probably give this 3 stars and don't buy this. I know there is a hype round this book. It was created by the publishers because they knew it wouldn't sell otherwise so yeah, this is not a good book.